Blue represents the Tories, red for New Labour, and tan/yellow for the Liberal Democrats. I just find it fascinating that the majority of the votes for the Tories came from England. There is a pocket of Labour support in Northern England and London, but look at all of that blue! 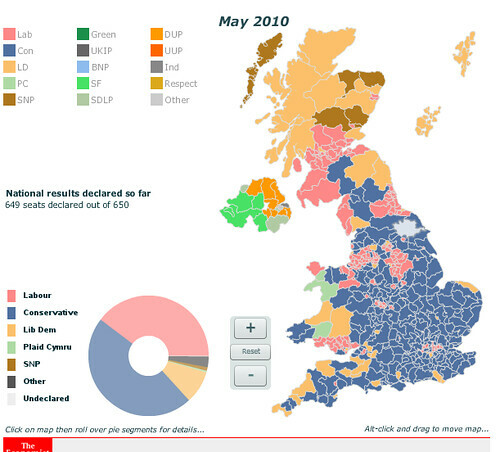 Wales seems to be split amongst three parties, and Scotland mostly goes to Labour and the Lib Dems. Divisions like this along some sort of border like this remind me a lot of the coastal and Northern states in the US that tend to vote “blue” (Democrat) while the inner states and Southern states tend to go “red” (Republican).